Haven't seen a worse camera angle before... You can't even see the road up ahead. My god!!! I thought it would be bad but.. not that bad! Pretty sure Red Bull's was even more focused on halo. Still puzzled that they didnt opt for halo or helmet cams, would have solved pretty much all issues. Yeah they've really ****** this up with the halo. Onboards are useless. We have a new winner for most screen obstruction. And, note in the onboard from Alonzo's car you could see hands and road, etc. I expect by race day they will have worked out some of these and by the next race the onboards from all will be much better. Hamilton getting out of the car there looked ridiculous. Oh man, what has FIA done..? Tried to kill and/or maim fewer drivers. Little things. Horner making an interesting point on Sky. The halo at least gave the opportunity to give some potentially great camera angles. Not just looking forward but maybe looking backwards at the driver or down in to the cockpit. Instead the cameras are exactly the same they were and just completely unequipped for the task. Poor foresight given all the work that has gone in to putting these ridiculous things on the cars. Regarding those repeater start lights. There was a race (F3(?)) in Japan during the 80ies, where one car rear ended another, flipped into the air and hit the start light gantry at high speed killing the driver. These repeater lights are even lower, so two cars tangling (interlocking wheels) could be disastrous, unless I'm missing something. You're missing a description of how the lights had anything to do with that event in Japan. And, how 2018 technology for interconnecting the main lights and repeater lights could be comparable to 1980s technology. The problem was the structure not the lights themselves. If a car is launched, the repeater lights look low enough that a car could hit it. Remember Mark Webber's flip in Valencia one year, after colliding with a Caterham. They really did not think through these onboard cameras. Even the viewer has to peer over the halo. Comical. The onboard cameras are a disaster. They should rapidly stop showing last year's footage in commercials/promo's etc. Seeing the non-halo cars every time makes it harder to get used to it. They should stick to onboards from the front wing or using the rear of the t-cam. The 'usual' angles are just horrid. I don't really mind the halo in terms of aesthetics but it has completely killed the onboard cam. This just horrible on so many levels. My girlfriend had a peak at the onboard this morning and asked "what is this cr*p?". F1 is in a downward spiral. They should just stop using T-bar camera's. That's clearly over now, but that doesn't mean nothing will work anymore. They just have to figure out an alternative for that camera. I didn't think the halo was so bad until i saw the on board footage, bloody horrendous. I will never get used to the halo. Yyaaawn..The Halo is here to stay. Deal with it..quietly please. The biggest PR issue for Liberty coming into the opening round of the season was always going to be managing the impact of the halo and demonstrating that it's no big deal and not an affront to what F1 is perceived to stand for. 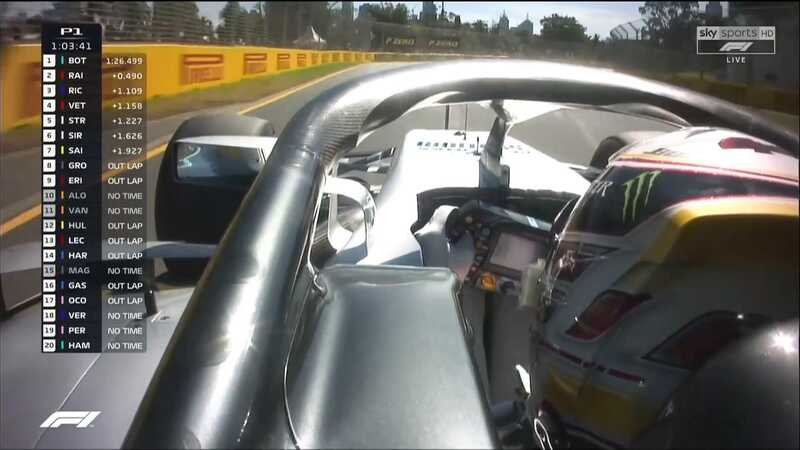 So in the two practice sessions we get loads of footage from onboard cameras which, instead of showing the usual mix of speed, skill and daring, have a big carbon fibre thing blocking the view. It's just about OK on a basic level with the T-cam, but the Merc one on the side of the roll hoop looks embarrassing and almost makes you wonder whether the team is intentionally trying to sabotage the halo through bad PR. Like, imagine if FIFA decided that football matches should be encased in a glass cube, and then the World Cup started and they realized that they could no longer film the action? The halo was the one thing everyone's been talking about for 6 months, and they turn up at the first race totally unprepared. You'd hope there's more to it than that, but on the surface it looks like a major failure of F1's TV crew to do their job. Halo is pretty terrible but there will come a day when it will save a life. As for the rest of the action it seems to be hotting up. Red Bull look pretty close to Mercedes and Ferrari not far behind that. Sadly, Ricciardo has been given a grid penalty but I still believe he could come good in the race. They need to adapt camera positions, that's all. Halo is fine otherwise. The 360 degree cameras are well placed for instance, so once they are a proper 'thing' it's all good. You don't know, it may even cost a life one day. You can clearly see everything up ahead, the wheels and steering input. When I read all of the comments I thought "oh my god, this must be terrible! ", I expected halo covering half the screen, somebody even said you cannot see the apex! some use(d) a lower camera position and in that case the halo was indeed blocking most of the track. Edited by Zava, 23 March 2018 - 10:08. Not wanting to be over-dramatic, but that Mercedes onboard should never have seen the light of day. Same old FOM. I don't care about the look of the halo. I don't like it, but what's done is done. The camera positioning will be figured out by the end of this weekend. There's going to be years of that thing, so get used to it. I don't see a point is complaining about it anymore. This seemed like one of the most intriguing Australian Fridays in years. The gap doesn't look at big as all the vocalizing makes it out to be. Are we going to see the gazelle legs come out tomorrow when the power gets turned up? People in the actual know have been trumpeting Merc's advantage, but today's running didn't make it that apparent for the single lap pace. The long runs looked more ominous though. Well this is indeed terrible. Is it possible to mount a camera on the front of the halo? That would give quite an interesting perspective. It would be nice to know if and how far down the line the FIA have gotten with looking at new onboard cameras. Clearly the current onboard positions are no longer good enough for broadcasting. It's not just one more thing we need to get used to, it needs to be better. The side of helmet cam may as well just be taken off the cars now to save a little weight but the overhead woudn't be so bad if they were raised up another 4-5 inches into a sweet spot where you could still see the steering wheel. People were referring to the side helmet camera. From that view it was blocking almost all of the track and you couldn't see the apex. Nobody can seriously defend that particular onboard camera but the overhead could be improved with some tweaking. No doubt the halo could very possibly save a life one day but could also deflect objects into the cockpit or hook onto bodywork and pull it in and around the drivers area. Think of Kimi and Alonso crashing in Austria and how the floor could easily have caught the front structure of the halo and and hooked on, broken off bits off the floor and trapped Kimi in the car or worse. It simply isn't the answer when it comes with it's own new potential for danger. Sooner the halo evolves into a closed cockpit the better. Suspected it would be much closer at the front in FP2 and really pleased to see Red Bull are so close from the start of the season. The rate at which they develop should have Ferrari and Mercedes worried and this could well be Max's first real crack at a championship against the "old guard" of Lewis and Seb. Wish I could know a bit more about the tires but these new graphics are hopeless. With everyone complaining about the onboard camera plus Halo, why don't they use the new nose-camera. The one halfway between the cockpit and the tip of the nose. I'd prefer that too, but I'm pretty sure they want to have the driver in view. Then they shouldn't have built the HALO. Was a difficult viewing for me, unless I can find a way of permanently watching from a position that doesn't include the HALO, I'll be switching over to 5 live - for a sport that's built upon visual aesthetics. Seems as if Hamilton is streets ahead already. Edited by rockdude101, 23 March 2018 - 11:25. The T-cam is fine. The Halo only blocks out the suspension arms. It was always clear that the over-the-shoulder cams wouldn't work with the Halo. Edited by ANF, 23 March 2018 - 12:09. I think the cam should be inside the halo, top front part. Best view in my opinion. Of course if it doesn't hinder the structural strength. Edited by dexadexasa, 23 March 2018 - 11:40. It truly is shockingly awful, hell, even my wife agrees with me. The last time she did that was 51 years ago when we exchanged marriage vows. Edited by Massa_f1, 23 March 2018 - 12:13. Why would they even show that camera? Makes no sense to me. It's fkn awful ! For a sport at the bleeding edge of technology and striving to bring F1 to a new mass TV audience, sticking a hoofing big lump of metal directly in front of the camera was a stroke of genius!!1! At least find a better spot for the cameras to go, can't expect the audience to accept this rubbish! This is really the worst part of this whole thing for me. Only now, all of a sudden, they realised that the halo might interfere with onboard cameras. What a farce.